The opening of the Port of Yokohama in 1859 marked the start of Yokohama's rise from a small fishing town to Japan's most populous municipality. Under the motto "Set Sail", Expo Y150 is celebrating the city's history and future from April 28 to September 27, 2009 with a colorful array of exhibits and shows that include a giant mechanic spider, a super high definition theater and more. The main area is the Bayside Area, which represents the sea and runs along the waterfront from Minato Mirai to Yamashita Park. It is further subdivided into three paid sites and four free sites, where most of the expo's attractions are found. Representing nature, the Hillside Area features a few additional attractions of little interest to foreign visitors, and is located adjacent to Yokohama's zoological garden Zoorasia, outside of central Yokohama. The Mother Port Area, finally, consists of the existing city center itself with its regular historic sites and shopping districts. 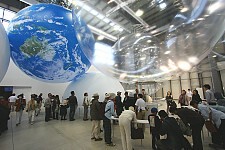 While some parts of the expo are free of charge, most of the more spectacular attractions are located in paid areas. 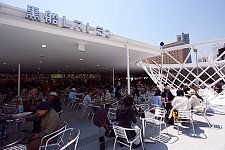 A day pass for unlimited entry to all attractions of the Bayside Area costs 2400 yen, and also provides discounts for several of Yokohama's regular tourist sites, such as the Yokohama Port Museum, the observation deck of the Landmark Tower and Yokohama Cosmoworld. The Bayside Area is open daily from 10:00 to 22:00. Admission to the Hillside Area costs 600 yen. The area is open daily from 9:30 to 17:30. The Hajimarinomori (Forest of Beginnings) Site is home to the giant metal spider, which comes to life five times per day for about 20 minutes each. A food fair and some minor attractions are also found here. 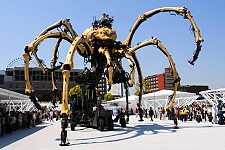 15 meters tall and almost 40 tons heavy is the metal spider by the French company La Machine. Eight people control the movements of the mechanic animal, as it walks across the Hajimarinomori Site and occasionally spits water at the audience. Between shows, the spider is resting outdoors. Yokohama Monogatari (The Tale of Yokohama) is a small exhibition about the history of Yokohama, everyday life in the early days and Commodore Perry who forced the opening of Japan's ports with his fleet of black ships. There is also a tiny movie theater, where historical footage of the city is shown. Unfortunately there is no English information. 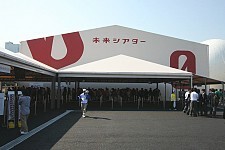 A main sponsor of the expo, Eneos is Japan's largest oil company with two refineries in Yokohama. 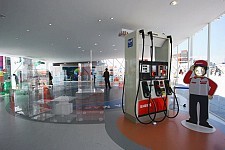 The Eneos Pavilion offers information on the company's history and its advances in the field of new energies. There is also a gas pump, a speaking Ichiro panel and a large satellite image of Yokohama. All the displays are in Japanese only. Chinese dishes, pizza, burgers, sausages and other fast food, as well as alcoholic and non-alcoholic beverages are available at this food fair. According to the official guide, the restaurant is supposed to evoke the days when the port was first opened to the world, but little besides its name actually does so. Kurofune refers to the black war ships with which Commodore Perry forced Japan into opening her ports. Tomorrow Park contains the Baton movie theater hall and a stage where performances with Tanemaru, the expo's mascot, are held. In the evenings, Earth Balloon is launched and best viewed from this site. Baton is an animated science-fiction fantasy movie, which was produced exclusively for the Expo Y150 and features the voices of popular actors and actresses. The movie consists of three chapters, which are shown separately over the course of the expo. Unfortunately, there are no English subtitles. 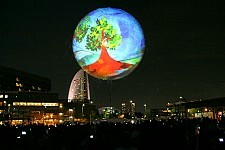 Images and animations about environmental issues are projected onto a large balloon in the night sky, accompanied by music and sounds. Mukai Chiaki, Japan's first female astronaut, directed the show's production. The balloon measures approximately 20 meters in diameter. The attractions of this site are located in a large, long, warehouse like hall on a pier. 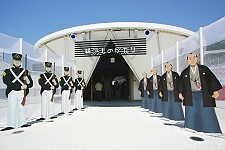 Visitors enter the hall from the back and line up to first see the high definition movie. 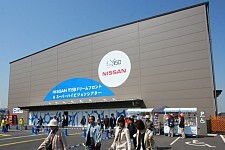 They are then led to the Pivo Lab to watch a presentation about Nissan's future visions, before proceeding to the Kotoba Park. The whole visit takes about 30 minutes, not including eventual waiting time. A super clear movie of the beauties of Japan, including the Aomori's Nebuta Festival, sunflower fields in Hokkaido and children jumping from a bridge into a river in Gujo, is shown in this theater, which boasts a 540 inch screen and a 22.2 multichannel sound system. Nissan's Pivo Lab features an animated movie about current environmental issues and future visions centering around electric cars. 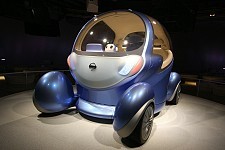 An actual electric concept car, Nissan's Pivo 2, stands in the middle of the room, but does not come further into action. The movie is in Japanese only. Upon leaving the Pivo Lab, visitors enter the Kotoba Park (Word Park), where everybody is encouraged to write their own messages of consideration towards the environment onto leaf shaped pieces of paper. The leaves are then sucked into giant balloons, in which they swirl around among thousands of other visitors' messages. The theme of the Hillside Area is satoyama, the Japanese concept of a hilly countryside where humans coexist harmonically with nature. 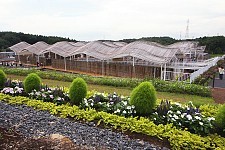 The area features some terraced rice fields and a large hall made of bamboo in which various projects by local residents are carried out. There are no signs or pamphlets available in English.